For cooking, use small, sweet pumpkin varieties with a thick flesh and a fairly small seed cavity, such as the Sugar Pie, Baby Bear or Cheese pumpkin. Instead of pumpkin, you can use kabocha squash, which has bright green skin marked with paler green stripes and pale orange flesh. Position 1 rack in the upper third of an oven and 1 rack in the lower third, and preheat to 425°F. Divide the pumpkins among 2 baking sheets. Drizzle the pumpkins with olive oil and season with salt and pepper. Place the pumpkins, cut side down, on the baking sheets. Roast, turning the pumpkins occasionally, until they are tender and beginning to brown, about 45 minutes; rotate the baking sheets halfway through the roasting time. Let the pumpkins cool, then scoop the flesh into a bowl. In a large stockpot over medium-high heat, warm 2 Tbs. olive oil. Add the carrots, shallots, celery, salt and pepper. Cover and cook, stirring occasionally, until the vegetables begin to soften, about 7 minutes. Add the garlic, nutmeg and sage and cook, stirring frequently, for 1 minute. Add the pumpkin flesh and broth, cover the pot and bring to a boil. Reduce the heat to medium-low and simmer for 15 minutes. 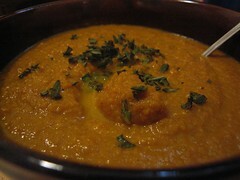 Using an immersion blender, puree the soup until smooth. In a bowl, whisk the cream until slightly thickened. Whisk in the reduced apple cider until blended. Ladle the soup into warmed bowls and drizzle with the cider cream. Serve immediately.